Above the shore at Thurstaston there are some fields. If the tide is in and I can't watch the waders from the beach I like to have a wander along the Wirral Way that bisects these pastures and meadows. 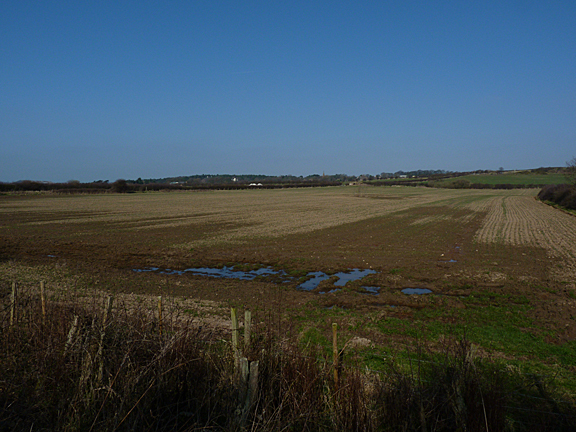 Sadly these fields have been farmed for many years, like the overwhelming majority of the UK's farmland, in a way that has devastated wildlife. However the ancient and majestic hedgerows that delineate them are intact and our native wildlife is stubborn enough that there is usually something to see if you are either lucky or (more likely) persistant. Today I am walking along the far edge of a field close to the steps to the beach, not a route that I would normally take. I come across a small hole in the hedge, an opening that I made a little wider a couple of years ago when the field beyond held a good sized flock of wintering Black-tailed Godwits. I haven't looked through this window since the Blackwits abandoned the field for their Icelandic breeding grounds back in the Spring of 2011. It is a little overgrown, a couple of bramble stems cross the opening making my window look cracked, derelict. I push through the hawthorn to the peephole and remove the offending brambles then peer out across the field. Last time I had looked it had been pasture for a herd of beef cattle. Since then it has been planted with a cereal crop, probably wheat, it is hard to tell from the stubble, all that remains from the harvest. The farmer has managed to crop all of this field unlike some of the others around the Patch. The soils here are of a heavy cley and hold the water, the deluges of this summer have left many of the fields saturated and out of bounds for heavy machinery. It also means that no seed for next year has been planted this autumn, bad for the farmer, good for the birds. Looking out over the field I can't see much and I know that many of the local birdwatchers regard this as another over-fertilized, intensively farmed desert not worthy of a second glance. A couple of Magpies are picking about some waterlogged furrows. A Blackbird swoops down from the hedge about a hundred yards to my right and lands by a muddy puddle. That is all I can see for the moment. However, I like this field. It has potential. I'm sure, given time and effort, much can be seen here. I can imagine a decent flock of geese in here, some nervous Partridge cowering under the far hedgerow, a Yellowhammer above them. The stage is set for Brown Hares, Skylark and Buzzard.